Audra L. Perkins (CRD#6579943) was born in 1985 in Dallas, Texas. Her professional experience includes practice of public accounting with KPMG LLP, Systems analyst with Thomson Reuters, consultant assistant with GuideStone Financial Resources and Merrill Lynch, and a Virtual Assistant with Financial Advocates. Ms. Perkins experience with GuideStone Financial Resources provided her an opportunity to work with socially responsible investments. 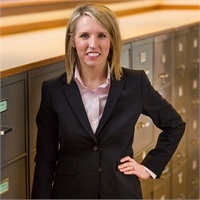 She joined NRSmith and Associates in 2018. Ms. Perkins spends about 100% of her time in whole life planning including investment management.